The Storied Life of A. J. Fikry and Granny's Favourite cardigan are underway, and both receive two thumbs up. As the NPR review mentions, A. J. Fikry is a love letter to reading and the power of books, and I'm enjoying it immensely. Tugs at your heartstrings. A widower runs a bookshop on a remote island, and he's struggling with the death of his wife and his own curmudgeonly ways. When something special is left in his store, his life changes completely. A little cliched, but I recommend it. The little cardigan is fun to knit, and the pattern is written for a huge range of sizes, which is spectacular. I rummaged around in the yarn bins and found some deep stash to use -- Brooklyn Handspun Instant Gratification. Lovely stuff! A dreadful cold struck our household just in time for the long holiday weekend (ugh). While it wasn't the relaxing weekend I envisioned, we managed to do a lot despite feeling cruddy. We started Saturday off right with a trip to the Evanston farmers market (rhubarb! Bennison Bakery's rhubarb cream cheese danish!). I tried two new recipes, both from Smitten Kitchen: ramp pizza turned out awesome, and rhubarb snacking cake is delicious (snacking cake? how's that for a concept? I love it!). 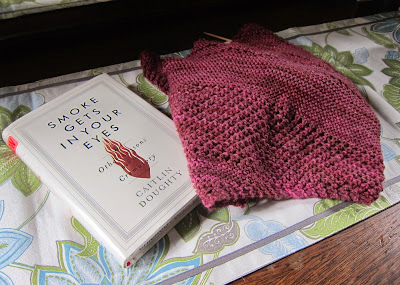 I didn't sew any buttons onto the baby sweaters I'd already knit, but I did block a shawlette that had been languishing. 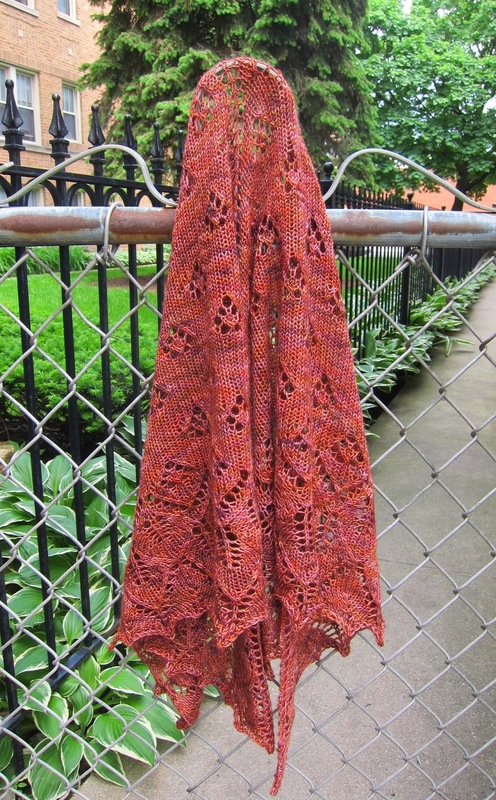 I enjoyed knitting this, but I'm not sold on the tight twist of the yarn. It doesn't help that while the colors are beautiful, they're not very "me." It didn't use very much of this mega-skein of yarn (600 yds), which is a shame! Nice free pattern. I'd recommend blocking the edging a little more severely than I did to get pretty points. Smoke Gets in Your Eyes can be rather gruesome and overly descriptive at times, but it's interesting and thought-provoking nonetheless. I find myself skimming over certain parts when my stomach starts to give out. Good choice not to enter the mortuary sciences on my part, I suppose. I'm copying Ginny by knitting an Antarktis. Nice pattern -- repetitive, but the texture is lovely, and the end result is a shawlette that is lacy, but not frilly. Quite wearable. 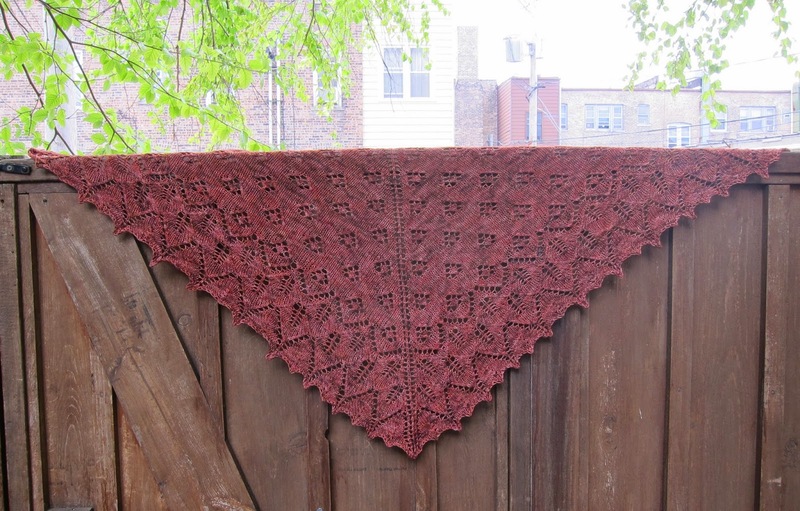 I adore the yarn, Malabrigo Finito. Deliciously squishable, and the colors (Jupiter) are gorgeous. 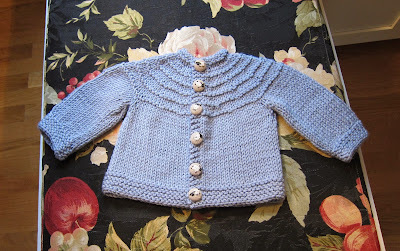 What I should be doing is sewing buttons on four wee baby cardigans, but I never seem to find the gumption. Perhaps over the long weekend? The patterns are Lottie, Yoked Cardigan, one of my own design, and Seamless Yoked Baby Sweater. More on these to come, I promise. 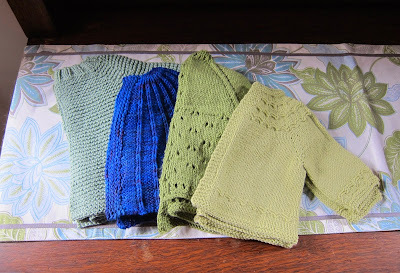 Those "five hour" baby sweater patterns are really something -- five hours for Elizabeth Zimmermann maybe, but not for me. Knitting the sweater took less than a week, but getting up the gumption to do the finishing work took a couple of months! This cardigan is destined for Paul's cousin's sweet new baby boy. The pattern doesn’t include buttonholes in the instructions! I added a buttonhole at the beginning of row 4 (K2, YO, k2tog, then follow pattern as written), and repeated every 10 rows. RYC Cashsoft just doesn’t do it for me. It’s similar to Cashmerino, but not nearly as nice. It has kind of a mushy feel or something? Oh well, the new mom's not a knitter, so I wanted something machine washable. The precious embroidered, cloth-covered sheep buttons had been hoarded in my stash for years -- I'm happy to use them at last. I'm trying to get over the idea of saving the "good" things for later.